Handley Page Bomber, the O/400 (Type H.P.12), was first deployed in early 1918 and had more powerful Rolls-Royce Eagle piston engines. 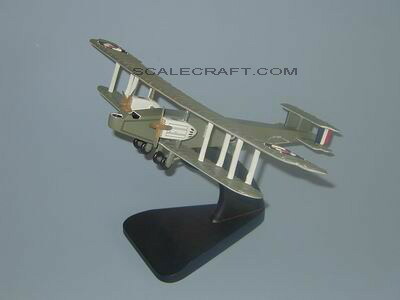 They were supplied to Royal Air Force Squadrons Nos. 58, 97, 115, 207, 214, 215, and 216, and remained in service until late 1919, when they were replaced by the Vickers Vimy bomber. In this version of the Handley Page Bomber, the fuel tanks were moved from the engine nacelles to the fuselage and the propellers turned in the same direction, instead of opposite directions, as in the previous model. The aircraft saw combat in the middle-eastern theater during World War I, in 1918, and one, with serial number C9681, was flown by Captain Ross Smith, from No. 1 Squadron of the Australian Flying Corps, who would later, in 1919, make the first flight from England to Australia, in a Vickers Vimy, along with his brother, Keith Smith, and two mechanics. Mahogany wood. Wingspan 18 3/4 inches, Length 11 3/4 inches.